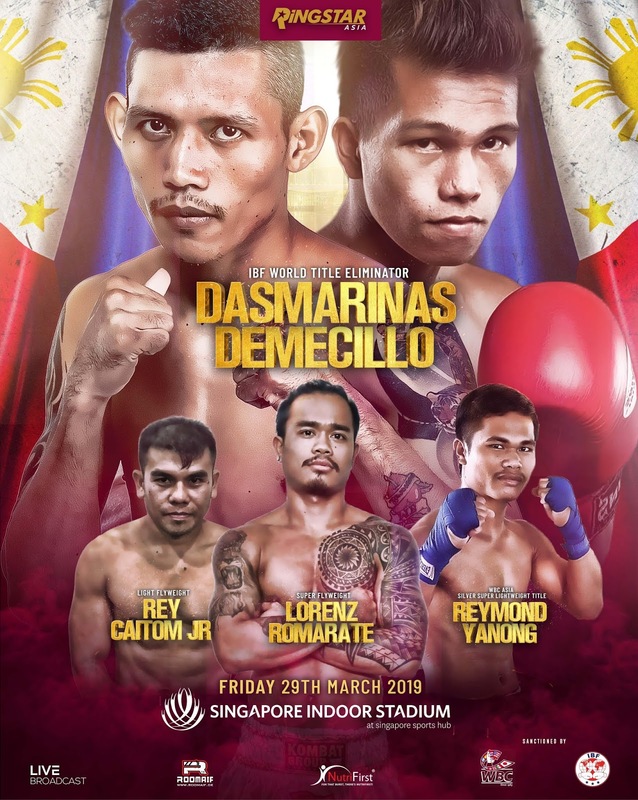 MANILA, PHILIPPINES: Five Filipinos are set to show their wares at Ringstar Boxing’s “Ridhwan Ambunda II - The Rematch,” to be held on March 29, 2019, at the Singapore Indoor Stadium. Led by IBO World Bantamweight champion Michael “Gloves on Fire” Dasmarinas (28-2-1), whose fight will be the co-main event. Dasmarinas is set to face fellow Pinoy Kenny “Big Heart” Demecillo (14-4-2), who hails from Cebu City, for an IBF World Title Eleminator fight. This will also be Michael Dasmarinas’ fourth fight under Ringstar’s banner. Demecillo on the other hand, was formerly WBF Intercontinental Bantamweight champion, and also a former 2-time WBF Asia Pacific Bantamweight Champion. The other Filipinos who are set to figure in the fight card are, 25-year old Reymond Yanong (9-4-1), who is set to face New Zealand’s Cairo George (16-1-0), for the WBC Asia Silver Super Lightweight Title; 32-year old Rey “The Future” Caitom (7-0-1), who will face India’s Hans Raj Takur (3-1-0) for the Light Flyweight Division. And 26-year old Lorenz Michael “Magic Mike” Romarante, (11-1-1), who will face Japan’s 28-year old Yuya “The Problem” Nakamura (9-2-1), for the Super Flyweight division. Tickets range from $38 - $118 and go on sale February 1, at www.sportshub.com.sg/Ridhwan- Ambunda VIP Ringside Sofa Seats are at $1,888 comes with uninterrupted views of the ring and a personalised butler service with free flow drinks. Early Bird discounts of 30% off all tickets till 28 February 2019 with promo code, ‘Ringstar’ All fights will be broadcast ‘LIVE globally with more details to be announced soon.